DeWayne Hauglie, age 90, of Elbow Lake, died Saturday, October 6, 2018, at the Barrett Care Center. DeWayne was born September 21, 1928, in Holmes City, the son of Michael and Clara (Olson) Hauglie. He was baptized and confirmed at the Evangelical Lutheran Church in Kensington, and graduated from Kensington High School 1947. On April 16, 1952, DeWayne married Bernice Carlsen on Bernice’s family farm in Nora Township. They were blessed with three children, Rita, DeLyle and Darla. In 1953, the family moved to Glasgow, Montana, where DeWayne worked at a Massey-Harris and Dodge dealership. In 1958, they returned to Elbow Lake. 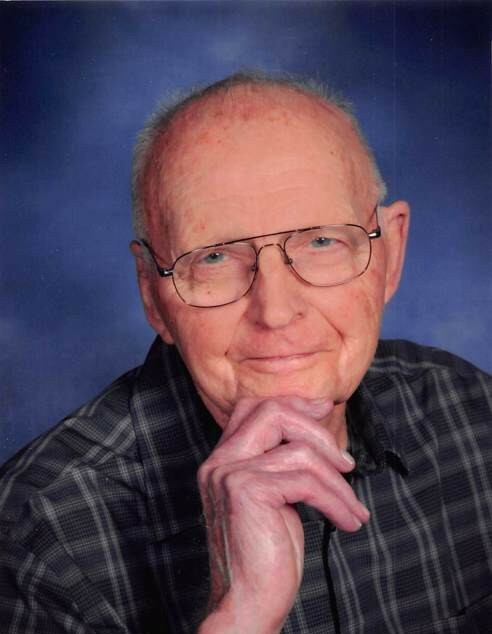 DeWayne worked at Leis Motors in Elbow Lake as a Certified Mechanic and Transmission Specialist from 1958 to 2002. In September of 2004 he started custodial work at United Lutheran Church, retiring in July 2015. He was a long time member of United Lutheran Church in Elbow Lake, the Gun Club and National Rifle Association. DeWayne’s interests included loading shells, trap shooting, fishing and hunting, especially pheasants and deer. He loved roller skating, ice skating, playing piano, keyboard and accordion. DeWayne is survived by three children, Rita (Gary Huemoeller) Gehrke of Barrett, DeLyle (Colleen) of Lisbon, ND, and Darla (Brad) Raguse of Wheaton; eight grandchildren, Tanya (Jon) Winter, Jade (Jen) Gehrke, Brandi (Luke) Knowles, Christopher (fiancée, Michele) Raguse, Ryan Raguse, Erika Raguse, Craig (Tara) Hauglie, and Michael (Anna) Hauglie; five step-grandchildren, Matt, Rachelle, Elizabeth, Tiffany, and Taviah; 18 great-grandchildren; brothers-in-law, Clayton Hauglie and Allen Carlsen; sisters-in-law, Cindy Carlsen and Beverly Larson. In addition to his parents, he was preceded in death by his wife, Bernice in 2015; one infant brother, Dennis Hauglie; an infant grandson, Bryan Hauglie; 2 brothers-in-law and 2 sisters-in-law, Melvin & Margaret Carlsen, Leonard Larson and Carolyn Hauglie. Memorial Service: 1:30 PM Sunday, October 14, 2018 at the United Lutheran Church, Elbow Lake with Visitation one hour prior to the service.